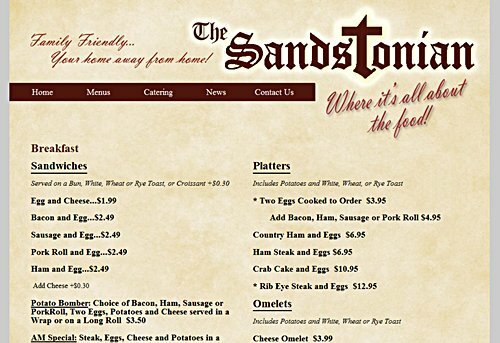 I coded a new website, The Sandstonian Restaurant, a website designed and managed by IIr Associates. 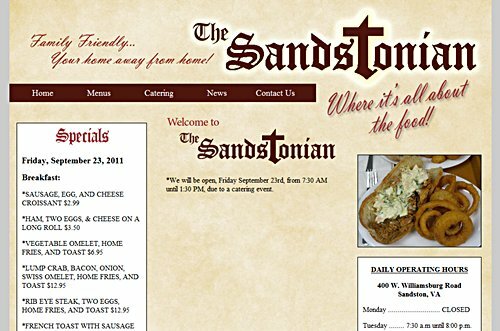 We have posted a new website this week for The Sandstonian Restaurant. The website is designed and managed by IIr Associates Inc., and coded by Jimmy Allen of GetYourWebsiteHere. This is a website that the client can update himself. The client can edit his menus, homepage specials, contact information and catering price lists with an online content management system, which features a push-button text editor. 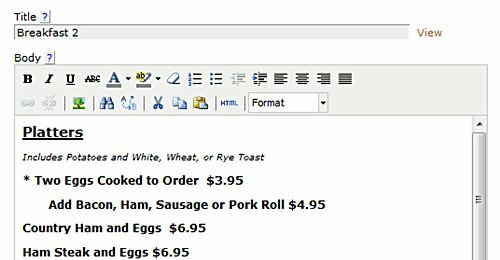 Below you can see a breakfast menu created with the client’s online editor – bold, italics, underlining, different sizes and fonts, and more, are available in a push-button text editor. The content management system is easy enough to use that the client can change the menus, specials, prices and catering lists on a daily basis. Below is a view of the push-button editor available for websites which the client will update himself. As you can see, the editor resembles and functions like any modern word-processing application. Users of Office, Word, or WordPress should have little trouble learning how to use this editor to update their own websites. We can set you up with a website that you can update yourself. You will find it a breeze to edit your content with the push-button text editor. Please contact us. Thanks!